Get ready to unload your Unity points. 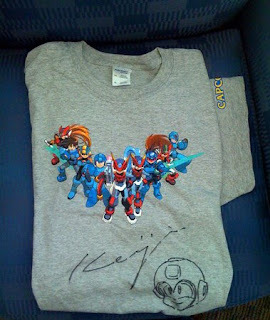 Capcom's got a spiffy Mega Man 20th anniversary shirt signed by Keiji Inafune up on the auction block. To bid, you have to be a registered Capcom Unity member and have a sufficient amount of Unity Points (read up on that here.) There's other stuff up for grabs as well, check those out here. Fortunately for me, I'll be saving my Unity Points for another day; I already own such a treasure. Yeah, where did your parents get that shirt anyway? I have one from when he visited New York and did the signing for the first Star Force games. I wore it so much though that his sig wore off and the picture's fading. At the time that was my only Megaman shirt. All I can say is, we have friends in extremely high places.